CDA Pro Audio Appointed Malaysian Distributor for Aaton and Transvideo. CDA Pro Audio Malaysia has been appointed distributor for Aaton location recorders and Transvideo Camera/broadcast support equipment. 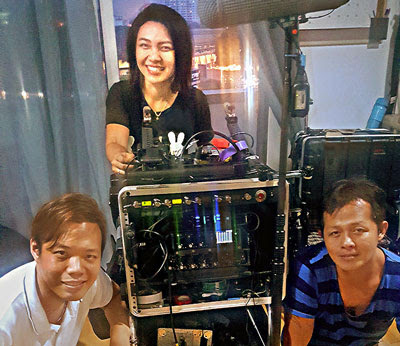 The CEDAR DNS 2 on location in Thailand - "a miraculous box"
BANGKOK: One of Thailand's most respected location sound recordists, Samak Buapradit, has recently upgraded his location kit to include the CEDAR DNS 2 dialogue noise suppressor. Samak has been involved in over twenty Thai feature films, and most notably the hit movie Tom Yum Goong, which has become the most successful Thai movie to date. He has also been involved with numerous TV commercials in the country. Commenting through his business partner, Khun Jit, Samak said about the CEDAR DNS 2, "I had heard a number of people talking about this miraculous box that could remove background noise in real time. I thought that this was impossible and only a dream for the location sound guy, but my partner contacted the local agent, CDA Pro Audio Siam, and arranged a meeting at my office." Khun Jit continues, "It was so helpful that CDA Pro Audio had staff that spoke Thai, and they could give us really useful instructions on how to operate and get the best results from the DNS 2." "I was so impressed with the demonstration provided by the people at CDA Pro Audio that I instructed Khun Jit to purchase the DNS 2 immediately", said Samak. "I thought a device like the DNS 2 only lived in my dreams, but now I have one." Copyright © 2019, CDA Pro Audio Malaysia.